Naomi Watts was on hand for The New York Academy of Art hosted Auction and Party Honoring Artist John Alexander last night(October 11th) at Sotheby's in New York. 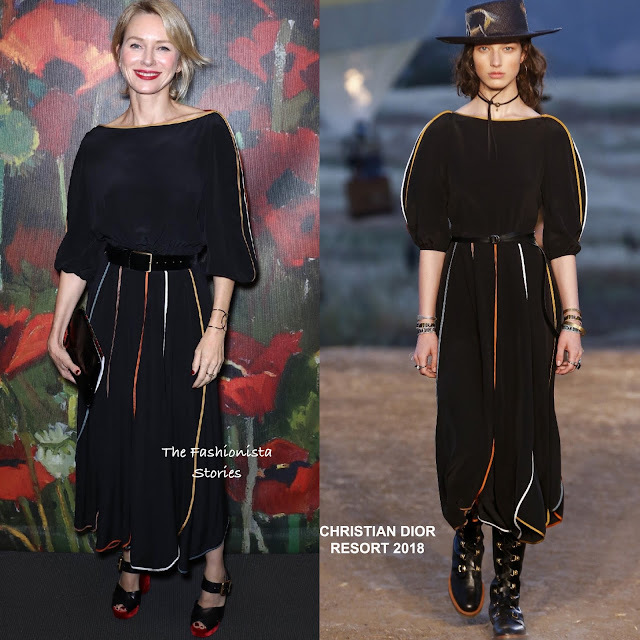 For the occasion, she wore a CHRISTIAN DIOR RESORT 2018 black dress which stopped above her ankles and featured contrasting colored pipping, three-quarter sleeves and a belted waist. Love this dress and it suits Naomi style. She finished up with a colored lip, a black clutch and two-tone sandals. What do you think of Naomi's look?